The Boeing 787 is already considered one of the most sophisticated commercial airplanes in the world. A part made using 3-D technology could lift the Dreamliner's engineering prowess even higher. The component, created by Spirit AeroSystems, is starting to show up at the planemaker's two 787 assembly plants, representing an emerging production trend designed to boost efficiency and lower costs. The part is relatively simple — a titanium back-up fitting for access door latches on the forward fuselages that Spirit builds in Kansas for Boeing. Spirit says the new part clears the way for the development of more complex 3-D printed components that can add to a jet's profit margin. "Going forward, there's lots of opportunities," CEO Thomas Gentile said during last month's Cowen Aerospace Conference. "There's literally dozens and dozens of titanium parts that we could 3-D print." According to a report by Reuters, titanium makes up about 15 percent of every 787. Flight International magazine calls 3-D printing one of the top aerospace trends to watch in the coming decade, with the technology "evolving into a technique for manufacturing an increasing range of parts, including load-bearing and hot-section components." 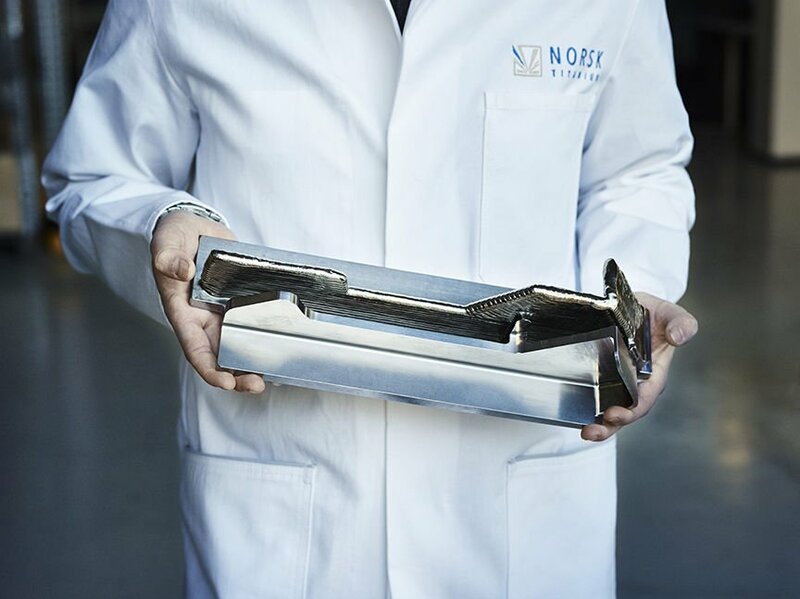 Gentile said the 3-D printed part — which follows nine years of collaboration with Oslo-based Norsk Titanium — greatly reduces waste and product costs. "Instead of machining out of a big block of titanium, we print a near net shape and then we machine it," he said. The first fuselages with the 3-D printed part started shipping to the Boeing 787 sites in North Charleston and Everett, Wash., in January. Boeing South Carolina officials referred questions about the part to Wichita, Kan.-based Spirit. "Integrating additive manufacturing capability into our production system to build end-use titanium parts expands Spirit's fabrication capabilities and puts us at the forefront of advanced manufacturing," Kevin Matthies, Spirit's senior vice president of global fabrication, said in a statement. While the Spirit part represents a major step toward the use of 3-D printing for commercial air travel, it's not the first part of its type to be installed on a Dreamliner. A 3-D printed bracket made by Norsk was used on a 787 last April. The first 3-D part used on a commercial airplane was an air duct installed on an MD-10 that FedEx donated to Orbis International. That was in 2015, and the plane was used as a "flying eye hospital" by the nonprofit dedicated to saving sight worldwide. Other industries see 3-D printing as a way to increase production, decrease costs and improve the workplace. German automaker BMW, for example, used the technology to create thumb guards modeled after each worker's thumb to reduce strain from repeatedly installing stiff rubber plugs into vehicle chassis. While prototyping accounts for most 3-D printing in manufacture settings today, the market for the technology is expected to nearly triple by 2024 to $34.6 billion, according to a MarketWatch report. The aerospace, defense and health care industries are expected to be the biggest users. At Boeing, the Dreamliner stable is seen as a key revenue producer, with improved profits on each plane delivered expected to help drive operating cash flow to between $17 billion and $17.5 billion this year, according to Greg Smith, the company's chief financial officer. Smith told analysts earlier this year that Boeing employees and suppliers "have done a great job" reducing the Dreamliner's costs, "and now we're moving into the next phase" with a production increase to 14 jets per month, split between assembly sites in North Charleston and Everett, Wash. Spirit is a top supplier for the program, and Gentile told analysts at the Cowen conference that the company started preparing last year for the rate increase. Spirit built extra units during the final months of last year, Gentile said, and will boost its own production to meet Boeing's goal of a second-quarter ramp up. Boeing hired 592 people at its North Charleston plant in advance of the rate increase, bringing the site's headcount to 7,341 workers. That includes those working at Boeing's other North Charleston facilities, including a factory that makes interior parts for the Dreamliner and a site that designs and builds engine parts.